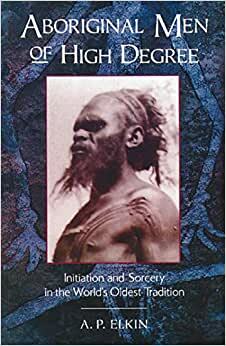 The first book to reveal the secret and sacred practices of Aboriginal shamans, Aboriginal Men of High Degree presents an extraordinary series of rites by which the young Aboriginal male begins the degrees of shamanic initiation--each marked by its own portion of esoteric knowledge. One of Australia's most eminent anthropologists, A. P. Elkin focuses on karadji, or men of high degree, who possess magical powers and who serve as channels between the Dreamtime beings and their own communities. As psychologists and psychic experts, the karadji are essential to the groups' social chesion. They are believed to cure and kill mysteriously, make rain, anticipate future events, and appear and disappear at will. Not content to explain away these phenomenon, Elkin boldly suggests that we enter into the karadji worldview and try to understand this remarkable culture on its own terms. Ships from and sold by Booktopia Australia. Former head of the anthropology department at the University of Sydney, A. P. ELKIN (1891-1979) authored eight books and numerous articles in Australia, the United States, France, and England, including The Australian Aborigines. The first time I read this book I was sleeping in my swag at Uluru (Ayers Rock) in Australia's red center, with only that book as my entertainment in the afternoons. I must admit that I probably would not have finished the book if it weren't for the lack of afternoon entertainment and the subsequent empathy I had for Aboriginal people while staying at such a culturally significant site. The contents of the book were a little extreme for me to read at first and I couldn't comprehend how the indigenous people I know could have had members within their clan who were so super-human prior to colonisation of Australia. It took me a year to come to understand what I had read and only after this time did I come to appreciate how significant the information was that I had retrieved from the book. It will take you a while but you will soon come to realize that the information contained therein is mostly anecdotal and was real to the indigenous people themselves. In addition, a great deal of the feats mentioned in the book were the result of lucid dreams (from a strictly scientific view point) or they were real if you choose to believe that. Lucid dreams are a widely known phenomena experienced by people of all cultures. If you are interested Dr Stephen Laberge did his PhD dissertation on it. You can find his book on amazon (Lucid Dreaming or something like that). Additional feats in the book are the result of multiple other scientifically explainable phenomena of a similar genera (such as the Kundalini awakening which is now a scientifically validated psychological experience that creates amazing hallucinations and so forth). Or you can choose also to believe all you have written, which I think is perfectly acceptable. You may choose to believe half and concede the rest to be exaggeration or cultural symbolism not completed interpreted by today's literal focus. Writing style is fine. Rather factual and non-emotive. It is slightly exhausting because it continues at full intensity without a break. IT is very list-type in nature and may overwhelm you with relentless facts at stages. But the content of the book will make it worth it if you are knowledgable enough to appreciate what is written. Might I also point out that this is one of only very few books that contain this information and it is unlikely that you will encounter anything like this book. So even if you purchase it for the novelty of having a book that is within a novel and scarcely repeated focus area, it will still be worth it. Fascinating glimpse if you're interested in the beliefs of other cultures or ancient myths and traditions but the writing style probably makes this book more of interest to the sociologist or other specialist or someone into dream theory instead of the general reader.